Ovarian cancer awareness will be highlighted in Lexington this weekend. A "teal-gate" event will take place Saturday in the Markey Cancer Center's Whitney Henderson parking lot, just prior to the University of Kentucky football game. Teal is the color associated with ovarian cancer awareness campaigns. 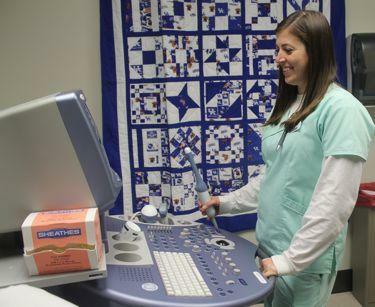 Ed Pavlik directs the Ovarian Cancer Screening Program at UK. Over the past year and a half, Pavlik says findings from an extensive study of a group of nuns were revalidated. He says research shows an increased risk of ovarian cancer in the women. "We think that this has to do with perhaps errors in healing. After all, ovulation is a wound and those errors in healing cause changes in the DNA that doesn't get repaired and this leads, after a lot of ovulation, to an event that brings about the onset of malignancy," said Pavlik. Pavlik says studies show that women who don't have children can have a higher risk of ovarian cancer, but medical researchers don't know why. He says about 16,000 ovarian screenings take place annually in Kentucky. Pavlik says the UK program uses a mobile van to make stops across the Commonwealth in towns like Prestonsburg, Somerset and Paducah. He says greater access would help to increase the number of women who get tested for ovarian cancer. "More widespread screening is wise to do at health departments and the reason for that is that the health department can accommodate a wide range of socio-economic candidates to participate," added Pavlik.